This visualization shows a single electron beam (the white dot) riding a plasma wave (yellow and lighter blue) at a high speed and high energy using a laser (top) or a particle beam (bottom) to generate the wave. Particle accelerators can help shrink tumors, form plastics and other polymers, kill foodborne bacteria, and contribute to many more uses in industry, medicine, security, and scientific research. Despite their wide range of applications, particle accelerators number only about 30,000 worldwide. If accelerators could be built for a lower cost and in a more compact size, that number could grow to the benefit of US industry, public health, research, and security. Exascale computing is a key to the further development of a promising technology called a plasma accelerator, which could be tens of times smaller than today’s accelerators with comparable output. 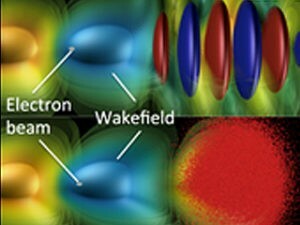 Scientists plan to compress higher energies in shorter distances through a plasma wakefield, a series of high-energy “pushes” caused by propagating laser or particle beams through ionized gas (plasma). Developing an affordable plasma accelerator will require complex computer simulations that simultaneously account for the behavior of a multitude of tiny electrons as well as chains of plasma modules, which can stretch over distances of millimeters to hundreds of meters. Exascale computers will also enable researchers to optimize accelerator designs and virtually test each component before they are built to reduce development costs. 04/19/17 Tom Evans from Oak Ridge National Laboratory discusses “Coupled Monte Carlo Neutronics and Fluid Flow Simulation of Small Modular Reactors (ExaSMR)” – research being conducted as part of the Exascale Computing Project.